There is no bigger cloud hanging over WrestleMania 32 than a potential Stone Cold Steve Austin vs. Brock Lesnar Texas Death Match. With the Stone Cold Podcast just hours away, tonight the question will be answered once and for all, will Austin vs. Brock take place at WrestleMania in AT&T Stadium? The hype for this match was more of a slow simmer earlier in the year when wishful predictions confused as facts were interpreted to give fans hope that Austin would be coming out of retirement at WrestleMania for one more match against the beast incarnate. Austin and Paul Heyman gave cause for celebration after cutting promos on the Stone Cold Podcast for such a match, yet Austin has been adamant that he was just caught up in the moment and there is no match. 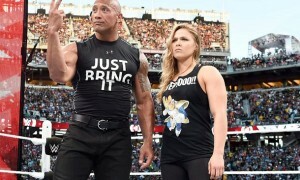 Tonight we’ll find out if the Texas Rattlesnake truly means it when he says no match. The fallout from that Austin promo took on a whole life of its own following the Heyman podcast. 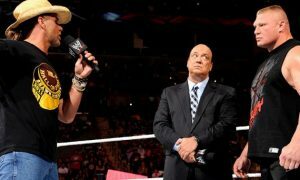 It was reported on multiple news sites the following day that Vince McMahon was irate at Heyman and Austin for promoting a match that will not take place. McMahon felt that the two were going into business for themselves. Austin said on a subsequent podcast that Vince “chewed his a%$ out for it.” Austin has also said numerous times since that he will not be wrestling Brock at Mania. Austin and Brock Lesnar will be in the same room with WWE cameras for the first time in years tonight on the WWE Network. Lesnar will make a rare podcast appearance as the special guest of Steve Austin. Lesnar never does these kinds of interviews for WWE television so the pairing is certainly unique. Especially when you consider that it wasn’t all too long ago that Austin was cutting a promo on Lesnar about how he’d like to fight him in a Texas Death Match in Dallas, Texas. It would certainly seem odd, especially for a company that likes to promote “episodic television” for Lesnar and Austin to ignore that previous podcast. So will the match happen or not? Austin says no, Heyman says no yet subtly teases it in media interviews, and Vince reportedly has told internal staff it isn’t happening. Here is what we do know at this point, in addition to the Austin-Heyman podcast mentioned above. All reports indicated that Lesnar vs. Undertaker III (well for this series) was scheduled for WrestleMania 32. Yet, Lesnar vs. Undertaker Hell in a Cell match was hot-shotted to Hell in a Cell out of nowhere. All reports indicate that this was a recent change made by Vince McMahon due to a change of plans for Lesnar at Mania. This is a bigger investment in just changing a match. This is paying Brock for extra dates to build and do a match that wasn’t scheduled until next year, as well as a big payday to Undertaker which wasn’t likely on the books until next year. In order for Vince McMahon to make a business case for that, he has to have one hell of a plan set up for Brock at Mania. My first thought was that he got the Rock to agree to wrestle Brock at Mania. Other than Brock vs. Austin, there isn’t another logical reason to make these investments in a Mania match-change. Maybe Austin (and this is highly hypothetical), the conversation between Austin and McMahon went differently. Maybe Austin asked for time to train, feel himself out inside of the ring, and then get back to Vince with a decision. Maybe the decision was yes? Again, highly hypothetical, but maybe Austin changed his mind about the match? Keep in mind that these new plans only surfaced in recent weeks according to several reports so the timeline makes sense. When Austin re-signed with the WWE to do more podcasts for the Network back in June, Lesnar’s name was never on the initial guest list. 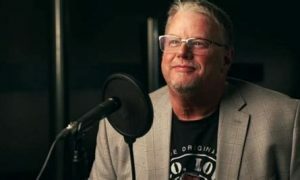 At the time, the WWE sent out a press release promoting that Hulk Hogan, Undertaker, and Sting would be guests in the near future on Austin’s podcast. I would assume that Lesnar’s name would have been promoted had he agreed to do it back then. It was only in recent weeks that it was announced Lesnar would be coming on the podcast. What inspired that change? All I know is this. That at the end of the podcast tonight, we will all know the future of this match. Austin and Lesnar leaving on a friendly note or without any kind of an angle is tantamount to shutting the door and throwing away the key once and for all on the match. If the podcast ends the way most fans hope it ends, it’s time to book your flight to Dallas on April 3, 2016, to see the return of the Texas Rattlesnake.